Turquoise has a long history as a cherished gemstone; it was the first-recorded stone to be used in jewelry, found in crypts in Egypt over 7,000 years ago. The name is derived from the word "Turkish"—how the French referred to the source of the stone. In the USA, turquoise is the most sought-after stone in mining operations. In the duller light of winter, turquoise can provide the glint of liveliness that lifts neutrals and looks terrific with every colour I can think of, even if you don't wear the hue as clothing. Though the signature shade is that deep robin's egg blue, it also exists in green, like that mined in Colorado, and can contain brown or black matrix or webbing. 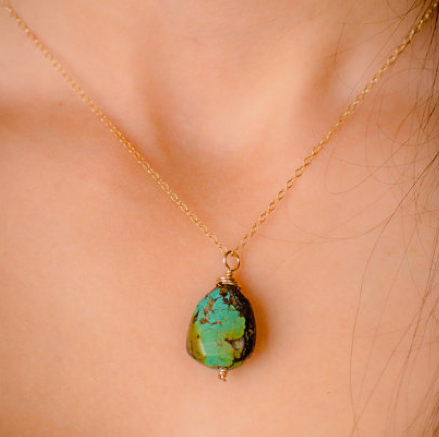 Because it's a soft stone (5 to 6 on the Mohs scale, similar to opal), turquoise easily absorbs body oils, lotions, perfumes or greasy substances, which quickly darken that luminous blue. 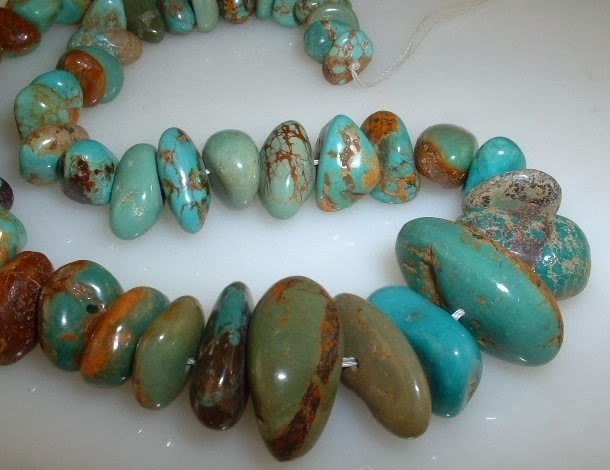 Therefore, the stone is often stabilized; a better description of the process than I can write is here, provided by Lin Valentine of the online bead store Southwest Turquoise, aka "The Turquoise Chick". Stabilizing isn't evil; it keeps your turquoise transcendent, but there are levels of quality in the processes used. Be wary of any material that looks infused with plastic or resin, or has a super-shiny, reflective surface. A jeweler or merchant should disclose any treatment (stabilization, use of fillers or dyeing). Just because you buy turquoise in an area where it is mined, such as the American Southwest, does not provide a guarantee of authenticity. While such silver-set pieces are what many women think of when they hear "turquoise jewelry", turquoise set in gold, both modern and antique, shows off the gem and may work better with your existing pieces. 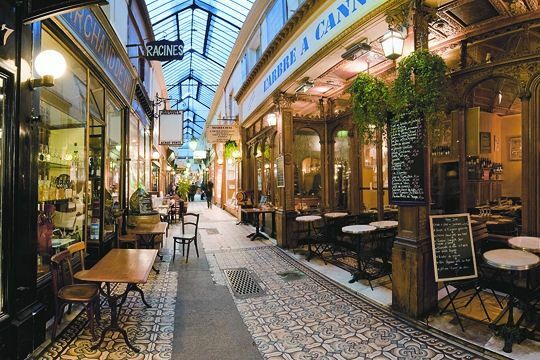 Let's tour the Passage's windows. A contemporary ring from Beladora, that I have loved for a good while for its asymmetrical assortment of turquoise set in 18k; you need to wear an 8 1/2 ring size. Price, $495. 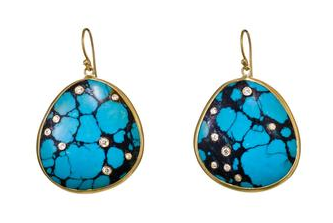 Kothari Elements turquoise earrings fuse organic and elegant, by setting tiny diamonds set in the matrix; price, $2,400. Dean Harris is a dream jeweler who creates classic, beautiful pieces; this necklace features Sleeping Beauty (Arizona) turquoise, renowned for its luminous sky blue and lack of veining. An accomplished wire worker could attempt something like his 30-inch linked turquoise-nugget chain. I, however, would buy it on a self-funded installment plan, because a small mound of broken 18k wire, mangled fingertips and heartbreak would result. From Barney's; price, $2,125. You need not spend big, though, for your piece of heavenly blue. Here's a tempting pair of Kingman Mine (Arizona) turquoise drops (about 1 1/4 inches long) set with gold plate, by Etsy seller MaisonettedeMadness; price, $135. Petite budgets are well-served by a simple but striking turquoise pendant (about 1 inch high by 5/5 inch wide) on a gold-filled chain (various lengths available); charming gift, or to wear yourself. From Etsy seller Anoushka Designs; price, $26. A last point before we duck into a tearoom: turquoise is perfect for women who prefer authentic materials but do not want the security issue or price point of precious gems. As soon as I saw the title of today's post, I got excited. 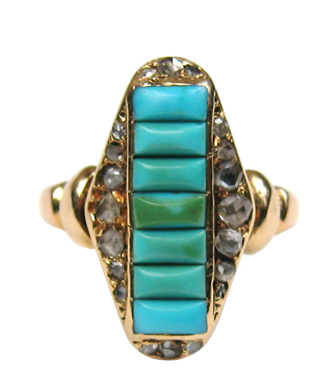 Turquoise is my favourite colour and I especially love it combined with gold tones. The Kothari earings are incredible, so beautiful, you have such an eye. The suggested background info will be a big help in the search. Thanks so much, your timing is perfect! 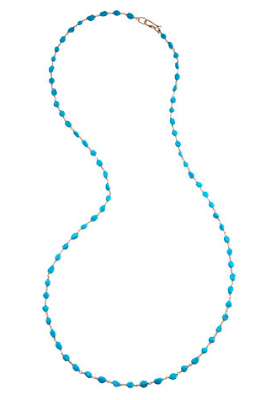 I love turquoise and have been on the hunt for some time for a chunky turquoise (possibly multi-strand) necklace (17-19"). They were everywhere about 15-20 years back, am hoping it's just about time for that cycle to repeat. I can no longer wear heavy earrings or would have been all over that pair you've shown here. The petite necklace from Etsy is charming and would look lovely layered with another piece. Isn't Etsy delightful? I have found some wonderful sellers for a variety of things from throw pillows from Indonesia to a wonderful soapmaker in New York. LauraH: I know and have some Anne Sportun pieces. This is very pricey for the materials. Almost posted those Boticca earrings. Skadegard bracelet will depend on whether you like faceted turquoise and I do not like clasp, to easy to lose- just my take. unefemme: Etsy would be a likely source, or something like this? Kristien62: Last spring, jewelry shopping/looking in NYC, had severe sticker shock and realized that the markups were so high (inevitably, due to overhead) that I was much better off with Etsy. Thanks for your comments on the pieces I was looking at, really appreciate it. I so enjoy your jewelry posts as I learn so much from them. When my son lived in NM I purchased some turquoise jewelry (without knowing much about it), and I have thoroughly enjoyed wearing it. Most my wardrobe is neutral without prints and this stone really jazzes things up. The small turquoise dangling earrings I bought from Barneys last year have turned out to be my most valuable new accessory. The color is so striking - they are very sky blue - and they are light and perfect for the life I now lead. Thank you for the information. I just trusted that a retailer like Barneys would not steer me wrong, but I hope that was true. With all the tribal prints that are showing up in the fashion mags this is the perfect accessory. I'd take the diamond studded earrings if I was in the market for a new pair. The vintage ones I have had for eons still look great....they are made by the Navaho nation artists. Big, heavy and bold. 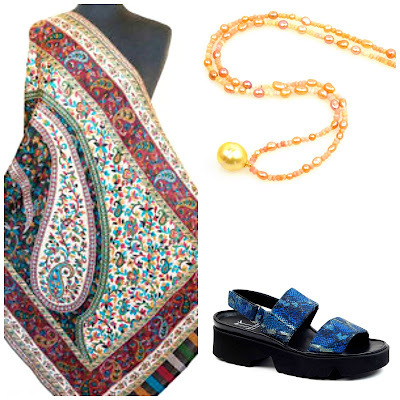 Love ethnic gems....like those squash blossom necklaces. I tend to appreciate semi-precious stones rather than precious. A perhaps strange habit I have is collecting interesting rocks - since childhood actually. 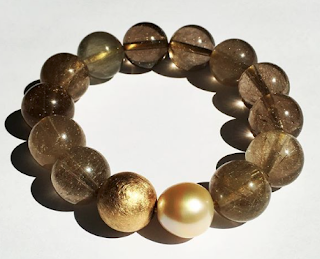 I love the look of jewelry when it is raw and imperfect - not so polished (except for pearls of course ;) , it imparts something gloriously archaic and mythological. continued from Anon@3:03 comment above. I just wanted to add that the first ring (Beladora) you show here is exactly what I mean. It looks like it could have been found in ancient tomb (I mean that in a good, not morbid way!). I just love it. I really like turquoise and silver with basic sand coloured clothing. I would like a stunning turquoise necklace. I will look n Etsy. Cornelia: Yes, it's the perfect pick-up stone against neutrals and holds its own with prints. LPC: Gorgeous with your grey hair! hostess: If they are big and heavy, do you wear them? A friend had an earring like that made into two pendants, one for her and one for her daughter. Anon@ 3:03: Uncut stones have a particular charisma and I love uncut amethyst especially, if the colour shows well. Raw diamonds, less so; though I want to like them many of them look dull and dun-coloured. That Beladora ring is special, I know just what you mean. Mme: I think sooner or later you will find one there and we would love to know what you choose. I love turquoise--when I wear it, my grayish lake-color eyes look true blue. Though silver settings are best for me, I really admire turquoise with gold, and the pieces you've picked are very special. It was fun to see them. Always loved turquoise but never bought a single piece because I didn't like the combo with silver and/or the Ethnolook of it. 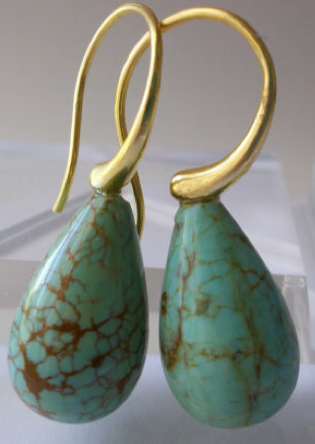 The items you choosed make clear, that turquoise with gold makes all the difference. Suddenly turquoise doesn't look dated but very modern and current! Great eye, Duchesse, as always. Unfortunately I'm late to your Blog, otherwise would have commented on the Marant No Make up look (love) and how I downsized my own habitudes. Then I saw these and wow!! The colour knocks me out.....so, a whole new possibility to explore. LauraH: Dean Harris is one of my dream jewelers and I've posted his pieces before. These are beautiful. I especially enjoy matrixed turquoise so like the second pair best, but both are so beautifully designed. Thanks! LauraH: Oh, I see the second pair is cysocolla, a •very• soft yet brittle mineral that easily picks up body oils, lotions- all kinds of liquids. Sooo, a little dicey in terms of durability. Hmmmmm, not sure I want to invest in a material that may not be too durable. Thanks for telling me, I googled crysocolla but didn't find a lot of info. Darn, those earrings are stunning. Oh well, plenty of fish and all that. Les Montréalaises: What's so different?